Nice central location for all your day trips around the Island. The cottage sits on 12 acres of property and very private. Beautiful view of the water. Watch for wildlife on the road, Eagles flying over and sitting in trees. Bunk beds are a double over twin in second bedroom. Beaches for swiming are only 5 minutes down the road. Take a hike to the Fairy holes and the caves at the end of the road. Restaurants are 5 min away on highway, just cross the Seal Island bridge. Fitzgerald's family restaurant - home cooked meals. I can't say enough about Kim and her vacation rental. After our accommodations fell through at the last minute, Kim was ready for our arrival in just 2hrs. Our home away from home was cozy and comfortable with a wonderful view of the water. The kitchen was very well equipped and had everything that we needed. We enjoyed exploring the property and loved the little creek that runs through it. As we were spending Christmas there, Kim even brought us a tree for the kids to decorate. We loved the location of the property which was very central to where we needed to go. We highly recommend staying here and I know we will be booking this home again the next time we are in the area. Was so nice to meet you and your family, so glad you all had a great Christmas and you enjoyed your stay in the Cape. Perfectly located Cape Breton getaway! Can not say enough about Kim and her house! If you are looking to explore cape Breton and have a dog this cottage is a must! Full kitchen, two bedroom house with a good size living room and dining area. The yard with a view of the lake was spectacular along with the fenced in dog run was a great perk. We spent our nights by the fire pit star gazing and actually spotting a shooting star! This house is centrally located on cape Breton and was perfect to daytrip out of. Cheticamp for the slyline trail was an hour and 20 mins away, louisbourg fortress an hour, baddeck was 30 mins as well as Sydney 35 mins away. Kim was amazing and even quickly replaced our TV after a power outage damaged the existing one. Great stay, and highly reccomend if you have a dog! Best place ever to stay away from home! 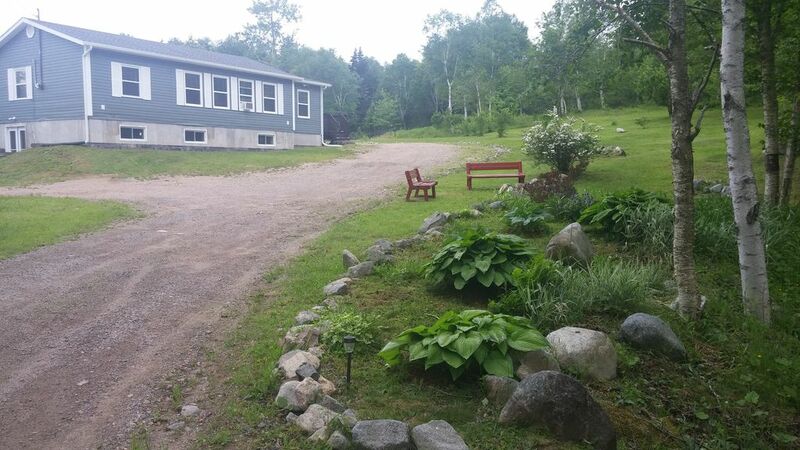 Wonderful cottage in the perfect location for peace and quiet whilst exploring Cape Bretton. We explored the Cabot Trail of course, but also much of Cape Bretton which was easy to do from this location. Good restaurants nearby and in Sydney. The cottage has everything you could wish for and Kim is helpful and quick to respond to any questions. So Glad you enjoyed your time here in Cape Breton, Hope to see you again. Kim's lovely, comfortable cottage was all you could ask for and more! Very clean! and well-equipped with everything you could possibly need! The kitchen was a delight to cook in, ( Kim has supplied good quality cookware and such, which is often neglected in rentals) and along with other extra special touches, made this one of our best stays ever! We had the pleasure of meeting and chatting with Kim, her wildlife photography of the immediate area is excellent! Thank you for sharing that with us Kim, along with your special stories about Maggie! Kim is a super host, quick to respond, and always helpful! We loved it here and will look so forward to a return visit in future ! I'm so glad you enjoyed your stay at the cottage. Hope to see you both again, I really enjoyed our chat, will keep in touch.